Change a child's life in just one hour every week-be an Everybody Wins! reading mentor at Northfield Elementary School. Everybody Wins! 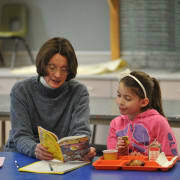 Vermont reading mentors are not teachers, tutors, or testers! Mentors are friends who read with the same child every week. Think of reading time like a bedtime story: a warm, comfortable time together to share a book. When children are read to one-on-one by a caring adult, research shows that their reading improves - and so does their interest in other subjects, their confidence, social skills, and interest in school. One hour per week, over lunch, at school, from 10/1 til the first week of May. We ask mentors to commit to one year of mentoring.